Eusebius, journeying from rural France to Paris to join the Cardinal’s Guard (as d’Artagnan did to join the King’s Guard at the beginning of The Three Musketeers, in 1625), runs afoul of the arrogant (fictional) Duc de Limon, the Grand Huntsman of France – an important royal position. On the road, he asks a peasant woman for directions and is warned, “The road to Paris? You poor fool! Don’t you know – haven’t you been warned by the peddlers? The city is a den of brigands! It’s full of thieves! Cut-throats! Ragpickers who’ll skin you alive to sell your pelt for what they can! The food there is too expensive and of poor quality! It’s too crowded! Too noisy! Little, rabbit, I beg you … DON’T GO TO PARIS!” Two wandering scoundrels, the gypsy Zoltan and his anthro “trained bear” partner Martin, steal all his expense money. In addition to his other troubles, Eusebius arrives just after the Cardinal has died. (That was in December 1642.) Richelieu was in poor health and knew that he was dying, and tried to set up an orderly succession, but nobody knows how well his replacement will do. What’s more, Louis XIII is in poor health (he died in May 1643), and his grandson, the future Louis XIV, is only four years old. The entire royal court – all of Paris – becomes a hotbed of speculation, scheming, and factions. Eusebius becomes a Cardinal’s Guard, but meanwhile the Duc de Limon has been promoted to Lieutenant General of the Parisian police and ordered to end the duels in the city. Since the King’s Guards and the Cardinal’s Guards are always dueling, despite their orders against it, Limon takes the opportunity to have Eusebius thrown into prison. The bunny is soon freed but, disgraced, he is cashiered from the Cardinal’s Guard. One of the friends that Eusebius has made in Paris is de Lisière, a low-class but talented poet who sells his talents to the nobility, both in writing anonymous political slanders against his patrons’ enemies – one of whom is the fast-rising Duc de Limon – and in writing love sonnets for callow noblemen to pass off to their lovers as their own works. Eusebius also meets Master Brioché, a puppeteer and dentist(!) who needs a new partner; his old partner, Fagotin, having been assassinated. Eusebius gets into more trouble with apparently everyone: Limon’s supporters, Limon’s enemies who feel that he will draw too much notice to them, one of the callow noblemen whom Eusebius accidentally reveals is not the author of the love poem that he is reading, and Fagotin’s son, a hot-headed assassin-for-hire (also a chimpanzee) who feels that he should be his father’s replacement. At the end of Vingt Mois Avant, Eusebius is being persecuted by Limon, is in danger of assassination by Limon’s political enemies, has been challenged to a duel to the death by one of the best swordsmen (swordsdogs in this case) in Paris, has Young Fagotin gunning for him, and is kidnapped by parties unknown. 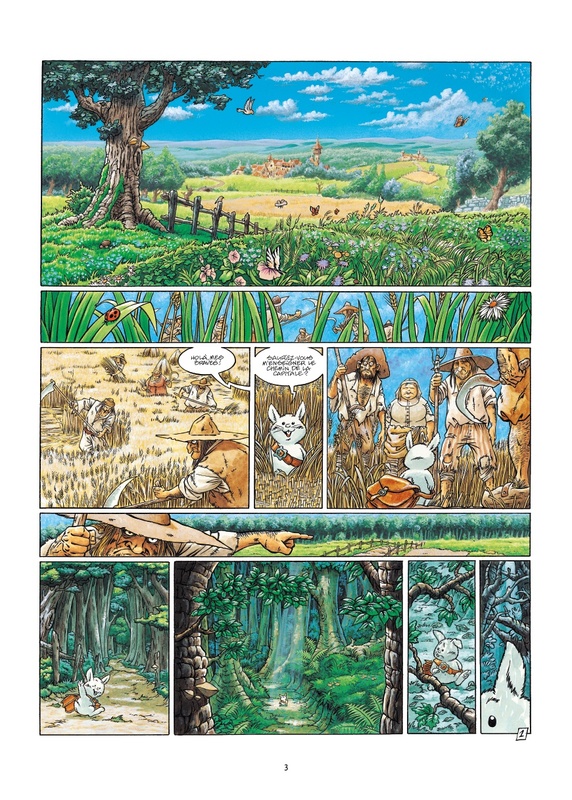 This hardcover bande dessinée has 48 pages as usual, but don’t miss the unexpected two final pages on the back endpapers. 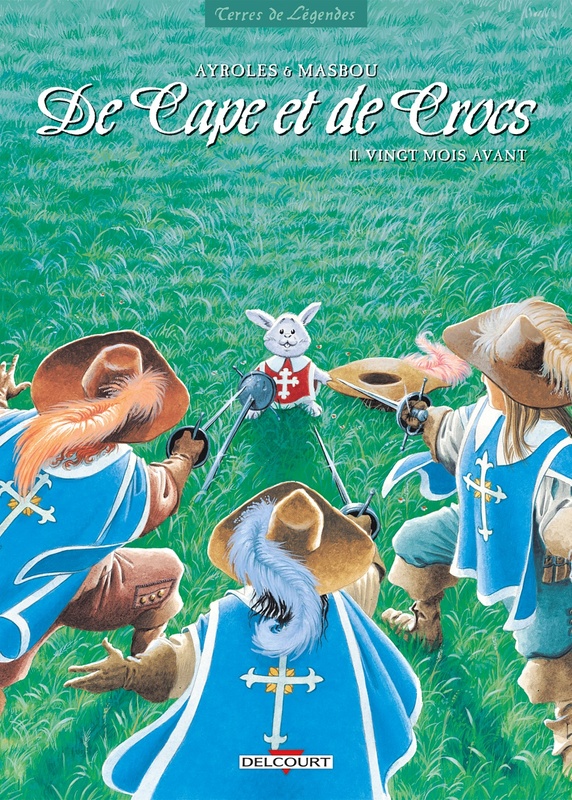 For furry fans, particular draws to Vingt Moins Avant are Eusebius (the cutest bunny-rabbit in the world), and the other anthros scattered among the Parisian human populace. Imagine a duck buried under one of those towering 17th-century wigs, or a hound with a finky narrow moustache and 17th-century curled long fur. (Or the human women in the exaggerated low-decolletage dresses of the period – barely Safe For Work.) Young Fagotin, in contrast, the chimp who is rebelling against society, dresses like one of the English Puritans. Reading Vingt Ans Avant is certainly better if you know French, but there is enough in Masbou’s visuals to make it worth the price whether you read French or not; plus this brand-new story line makes volume 11 an excellent place to start reading if you are a newcomer to De Cape et de Crocs. Alas, if the series has not been translated into English yet (since 1995), it’s not likely to be. Don’t fail to check out the authors’ website. More from the French publisher.